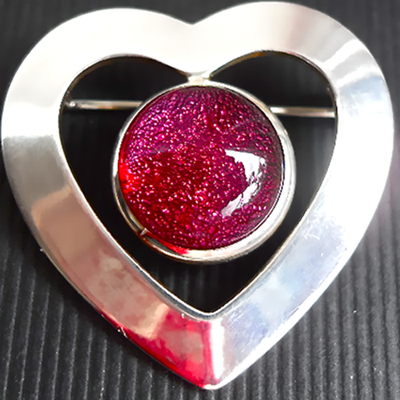 This plated silver heart shaped brooch has a Dark Pink piece of Dichroic glass in the centre. There are matching stud earrings. It measures 3cm x 3.5cm and is made of very good quality plated silver. The glass piece measures 1.5cm and is made of two layers of glass. A layer of Dark Pink dichroic glass, then a clear layer.